San Jose, California, took the top spot on Zillow’s annual survey of the hottest housing markets in 2019 for the second year in a row as tech jobs continued to drive workers to Silicon Valley. Orlando, Denver, Atlanta and Minneapolis rounded out the top five hottest markets, which Zillow predicts will emerge as frontrunners in 2019. San Jose, in particular, already commands upwards of $1.25 million for a median home, but Zillow Senior Economist Aaron Terrazas believes the tides may be turning. Zillow predicts which cities will have the highest housing demand based on predicted home value and rent changes, income and population changes, unemployment rates and job availability in the area. Some unexpected cities have risen in price, and demand, over the past year, according to Zillow. Orlando, Atlanta and Jacksonville, Florida, hadn’t cracked the top 10 last year buy, according to Terrazas, lower home values in the South are drawing in residents from other parts of the country. 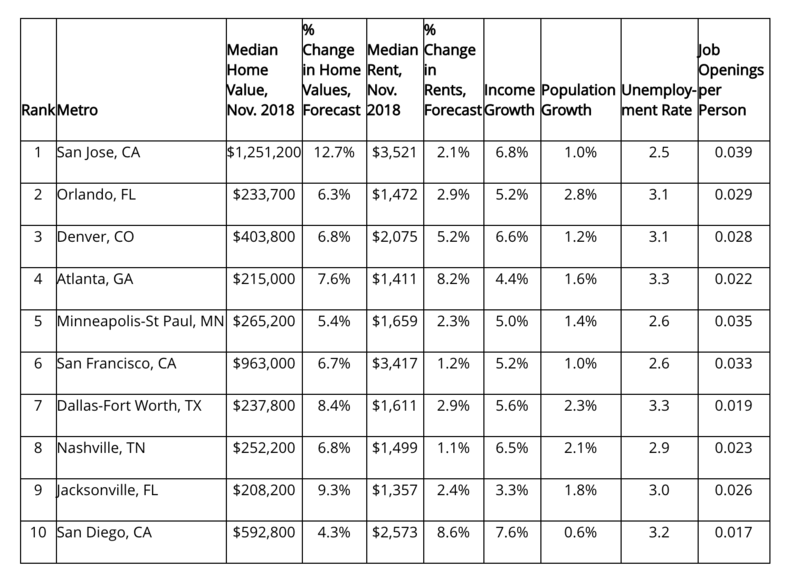 “Affordability is attractive – for both young professionals and booming businesses, earning markets like Orlando, Minneapolis, Dallas and Nashville top billing in 2019,” Terrazas said.